Sharp Wood has released eight albums of music from Zambia all told. Not much has been heard from the landlocked country, despite a little flurry thirty years ago when Shani! and a few other superlative discs were released. Shani! was an introduction from WOMAD, which later became Peter Gabriel's RealWorld label. Globestyle put out Zambiance! on vinyl in 1989. We discovered a bunch of great bands, including Shalawambe and Amayenge. Demon Records leapt in with their own compilation and also albums by those two groups plus Masasu Band. The peak of Zambian coolness was attained when Amayenge cut a session for John Peel's radio show and their song "Free Nelson Mandela" became a massive hit. The country is situated between Congo and Zimbabwe and the music sounds like it. There are elements of the chimurenga thumb-piano style of their Eastern neighbors and the intricate guitar patterns of their Western neighbors also. The speedy drumming style is all their own. This group's leader Brian Chilala was a protégé of Chris Chali, leader of Amayenge, and toured with them in their heyday. But he left and fronted various attempts at reggae and rock bands, along the lines of Sting's Police. Back in Zambia cassette piracy wiped out the local market but fortunately there were still bands dedicated to keeping the traditions alive. This is a great high-energy set of Kalindula music, incorporating dance styles from all the provinces of Zambia. The liner notes explain all the lyrics and the title, Vangaza! means let's dance, and defies you not to. Sharp Wood returns with another new recording of traditional African music. This one is a sequel to their excellent Zambia Roadside, which focused on the Southern Province. Between 1996 and 2010 Michael Baird (a "Hugh Tracey for our times") took his microphones into the bush and found music being played by Tonga, Leya, Lozi, Ila, Aushi and Bemba musicians to record. If that sounds like a lot, there are over 70 languages in Zambia! This CD is vital and engaging. It's wonderful that this music is not only being preserved but is alive and thriving. You can also see some of the instruments and listen in on the actual session here. Enoch, the guy playing the beaten one-string (or wire) instrument with gourd (the kalumbu) is phenomenal. There is something for everyone here: tight acapella vocal harmonies, a rocking xylophone solo by an old master, and complex drumming grooves. Recorded in Zambia and Zimbabwe in December 1996 and October 2008 here is another dose of wonderful pastoral music from the valley of the Zambesi. The lamellaphones that make this music are usually made by the player and each is tuned differently to reflect the temperament and voice of the performer. Their songs range from humorous to spiritual and one thinks of the Arcadian shepherds of classical antiquity similarly amusing themselves in tranquility. I think the tines are made from hammered and flattened nails; they are mounted on a wooden sounding board with a spider's egg sac added beneath as a resonating membrane. Formerly the soundbox was a gourd but nowadays it's more often a tin can. The music is mesmerizing, usually the two thumbs set up opposing rhythmic patterns that occasionally intersect but I think unless you are ambidextrous you will have a dominant thumb; though neither a more strident bass or a more developed melody line manifest, the tempos definitely become staggered and weave complex intersecting patterns. 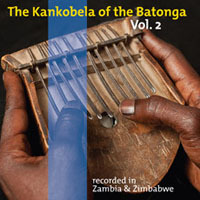 Hugh Tracey recorded the Batonga in 1957 and found a player in every village but today, sadly, it is nearing extinction with no young people taking up the instrument. How sad that such beautiful music should be losing out to the monoculture. There was a time when ethnomusicologists were scouring Africa looking for the "blue note" -- the elusive flatted seventh that signalled the birth of the blues. Recently Bela Fleck went looking for the original banjo & came back with a Grammy, and so on. But the musical streams have been muddied by so much plodging back and forth that it is unlikely anyone will find an African guitarist who has not heard a Chuck Berry riff. Now the quest seems to be quite different: finding bands who are clearly influenced by the West, like the endless James Brown covers that have surfaced from the Bight of Benin to Angola. Here is a band that sounds exactly like a British garage band of the 70s. It's hard driving and also sung in English so you might think it was the lost Pretty Things tapes if it didn't identify itself as Zam Rock: pop music from Zambia from the post-Independence era when there were still 70,000 Europeans living there. 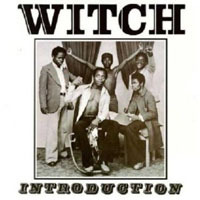 Though called Introduction, this is the second album from this group. It's easy to hear the influence of Hendrix, Clapton or Richards, particularly in the settings of the guitar, the effects pedals, and a bit harder and more intriguing to spot influences of Tim Hardin or less well-traveled popsters. Recorded in 1973 it abounds with wah wah and fuzz tone and some catchy lyrics and energetic playing. Michael Baird has undertaken a huge task. He has donned the mantle of the late Hugh Tracey, and his immense project is now taking shape. As a musician, and producer of Sharp Wood Records based in the glorious Netherlands, he has begun to record the remaining indigenous music of Southern Africa. When you hear Zimbabwe on the news it is usually accompanied by a shudder when you think of the repression and hardship the people are enduring. Around the time Hugh Tracey was making his epic Landrover trips through Africa to record local music, a big hydro-electric project was taking shape on the Zambesi river. A dam was built, creating Lake Kariba and flooding the Gwembe Valley. The people of the Valley, the Batonga, had to move to the North or South bank. Those on the North were in Zambia and those on the South were now in Zimbabwe. Hugh Tracey discovered George Sibanda and recorded him in Zambia in 1948 and on his subsequent trips through the valley. In 1997 Baird recorded a CD called ACROSS THE WATER (SWP5) which sampled the music of the Batonga from both sides of the valley, which is now a lake. Now he has returned and focuses on the thumb-piano music of seven surviving masters (only men play the Kankobela). Unlike the hyped-up Congotronix of Kinshasa with its amplified mayhem, this is more pastoral music, played to pass the time, tell stories during drinking parties, or accompany the performer on his peregrinations. There is still the raucous buzz and rattle of the metal tines and the spider-web membranes, plus the tin or wooden gourd resonators. Each track is a solo with vocal accompaniment, and the booklet gives us biographies of the performers and translations of each song. ("Why would you play instrumentals?" ask one 81 year old performer. "No one would know what the song is about.") The recording is clean, the musicianship excellent; I suspect Baird's own musical background is a big help in finding the right performers. Sadly these are the last surviving players of this traditional music: no young people are learning the instrument, preferring the guitar. While this was recorded in October 2008 it really could have been 50 years earlier and Hugh Tracey must be very proud! 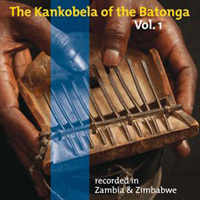 Aaron Nchenje, one of the musicians on The Kankobela of the Batonga Vol. 1, can be seen here on Youtube. 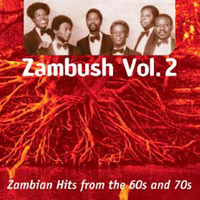 Another collection of Zambian oldies, this one predates Volume One which anthologised the big bands of the 80s. Nashil Pichen Kazembe is the only familiar name here. The other names are legendary, meaning people remember them in Zambia, but no one outside the country got to hear them. Their sounds are also very different. The Big Gold Six were started as a spin-off of Radio Zambia announcer Alick Nkhata's backing band. They advertised Players Number 6 cigarettes which had a big gold 6 on the packet! They played live on the radio almost nightly and were encouraged by an ex-pat pianist from England who was into jazz and explained western music theory to the bass player. The band were all self-taught. After touring the world and playing at Expo 70 in Japan the band were hired to back visiting musicians at a local hotel in Lusaka. But then were accused of being unprofessional when it turned out they couldn't read the charts. The band were duly enrolled in night school to learn musical notation and in exchange gave classes in music performance to the other students! Drawing from folklore, fables and morality tales from all over Zambia the Big Gold Six had numerous hits. Their sound is catchy, the guitars cut out leaving them singing acapella over the congas in "Titwe titwe," based on a grain-pounding song. Excellent liner notes explain the lyrics and the cultural context of each song. Nashil Kazembe is well-known for his hit "Malaika" in 1970, recorded when he was living in Nairobi. He adapted Swahili rumba and the Twist to Zambian and Congolese beats. He started many bands including African Eagles Lupopo and Super Mazembe and had hits all over East Africa in the 70s. He died of AIDS in 1991. His sound is light and sprightly and more urbane than the others here. In 1974 Kenneth Kaunda declared that 90% of all music played on the radio in Zambia had to be national. Emmanuel Mulemena's career took off at this point. He died aged 41 in a car accident. Fans of the finger-picking style of East African guitar will adore his four tracks here. Overall, a well-selected set: the sound is a little thin but the spirit of great music run throughout this series. Somehow in the 1980s, when "World Beat" first caught on in the West we fans thought it would sweep everything up in a tidal wave. Places we'd barely heard of -- like Zambia -- suddenly disgorged their great musical secrets and held us in thrall. Just as suddenly I had a Zambian section (of ten discs!) in my library. Until 1964 Zambia was half of Rhodesia along with what became Zimbabwe. A vast landlocked country with 73 ethnic groups, Zambian music was heavily influenced by its neighbours, particularly the Congolese rumba. Hugh Tracey recorded Zambian miners songs in 1957 and these were reissued as FROM THE COPPERBELT on Original Music. George Sibanda was the best-known Zambian artist from this early era. Alick Nkhata was another pioneer of the Zambian pop scene during this time. His 1952 hit "Taxi Driver" and 16 other hits were collected on SHALAPO by RetroAfric in 1991. President Kenneth Kaunda, a musician himself, decreed in the 1970s that 90% of the music played on the radio should be homegrown. This did a lot to boost national self-esteem and stem the creeping rumba tide. In the early 80s the traditional kalindula rhythm from the Copperbelt was adopted to pop music and became a national sound. This coincided with technical developments when the Roland corporation of Los Angeles, who manufactured Dr Rhythm, the first popular drum machine, introduced the Boss Flanger. No one to my knowledge has discussed the impact of these effects pedals on African popular music but for me the sweet sweeping sound of the flanger is closely identified with East African music of the 1980s. In the mid-80s Nachil Pichen Kazembe (who had returned from working in Nairobi) became a big star, his hits resonating in Kenya and Tanzania with a distinctive Zambian sound that lay, appropriately, midway between Mapfumo's mbira-based lilting ballads and the rocking rumbas of Franco & OK Jazz, though more akin to Kenyan music than either, to my ears. WOMAD (World of Music, Arts and Dance) in Bristol discovered Amayenge and Shalawambe in 1988 and issued SHANI! a fabulous compilation from the Teal Records catalogue including "Lelo Baleisa" by Amayenge, Alfred Chisala Kalusha's "Basumbula" and "Kamusisi" by Shalwambe, all of which were smash hits in the small world I inhabit. 1989 was the great year of Zambian music. Amayenge did a session for John Peel (issued on Strange Fruit) which included the instant hit "Free Nelson Mandela"; Globestyle issued ZAMBIANCE! 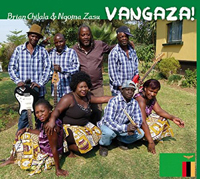 as ORB 37, also from the Teal Records catalogue; and the London-based Mondeca label went one step beyond issuing ZAMBIA!! (with two exclamation points), a compilation, along with three glorious LPs by Amayenge, Masasu Band, and Shalawambe's classic SAMORA MACHEL. Then predictably, things dried up for the next fifteen years. Now the torch has been picked up by Sharp Wood Productions, the estimable Netherlands label who are steadily working through the Hugh Tracey material but have taken time off for some other gems produced by Michael Baird. Baird points out that the breakneck rhythms are played on the drums, allowing the other instruments to drag a bit, seeming more laid-back, although they are also frequently playing at top speed. Most interestingly, he points out that the bass guitar is the lead instrument (just as in traditional Zambian music the lowest drum has the lead). The bassist also plays an octave-spanning style that creates a zooping busyness that propels the rest of the musicians. There are two cuts from Amayenge; among the other bands I had only heard of Julizya. The songs were chosen for topical or political lyrics which are explained in detail. Baird mentions that after inflation, piracy and the toll taken by AIDS, the Zambian music industry collapsed in 1993 with the closure of the Teal record plant. Another sad tale, but here's a chance to hear some vibrant and significant music that will warm the cockles of your heart. The legend began in 1952 when Hugh Tracey was roaming Africa with a reel-to-reel tape recorder looking for indigenous music. In Stanleyville he heard Jean Bosco (originally form Eastern Congo near the Zambian border) busking under the town clock and recorded him on the spot. That recording, released as GUITARS OF AFRICA in 1954 brought the unique sound of Katanga dry guitar to the world. The contrapuntal melodies, based on thumb piano fingerings, sound as much like Bach's "Two-part Inventions" as folk music. Bosco's record influenced Pete Seeger as well as a generation of African musicians, leading to his appearance at the Newport Jazz Festival in 1960. He went on to become a big star in Nairobi and popular all over Africa. This is the last chapter, recorded before his accidental death in 1992, and includes "Masanga" (the "Classical Gas" of Africa), along with seven other of his 150 compositions that brought joy to a continent. One of the world's great musical archives is the International Library of African Music at Rhodes University in South Africa, assembled by Hugh Tracey. 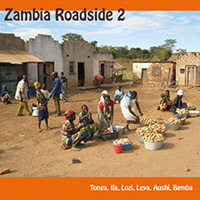 ZAMBIA ROADSIDE sounds like a missing part of the Tracey recordings but is in fact a new recording, and shows how some regions of Africa have folk music unaffected by radio and international influence. The recordings were made by Michael Baird, a young man with the same kind of gift and determination as Tracey. A musician himself, and also the eproducer of the Tracey reissue series, Baird has sought out exponents of various indigenous styles in the bush, but because he has an educated musical ear it's not just some random field recordings. Like his predecessor Tracey he knows how to spot great talent and get it on tape. And there is some towering talent here, like the band Green Mamba who are represented by three cuts. They have an energy that belies the fact that their percussion is played on a bottle, their guitars homemade. You can hear trap drums and electric guitars in their simple arrangment, it's so propulsive. The beat is Congolese rumba but that's just a framework for their own ideas. Another blistering performance is put on by guitarist Short Mazabuka singing a story-song about a girl named "Maggie" with his son pounding on a box and singing a passionate choral line in the background. For diversity there's a women's choir and court musicians (xylophone and thumb-piano) of Chief Mukuni's Palace performing two traditional Tokoleya songs. Hard-core folk is heard from the Ngoma Roots Band who play an hour-glass shaped drum with built-in buzzers, ngoma drums, xylophone and shaker. The members come from different parts of Zambia and find inspiration in their heritage. This is a well-crafted and thoughtfully arranged album that continues to surprise and delight.